A dual hybrid heating apparatus, method of assembly and operation to heat potable water in a tank by heat exchange with a fluid heated by free heat sources-waste heat from heat recovery units and insolation. Once a demand for heated potable water is satisfied, a controller issues commands that cause the fluid to bypass the tank and instead flow to a further heat exchanger. Temperature is monitored downstream-if excessive, then the fluid is sent to a heat dump. A further fluid is heated by heat exchange at the further heat exchanger and then routed to where a parabolic dish solar concentrator vaporizes it to turn a blade of a turbine generator to generate electricity. Heat is extracted from the vapor to form condensate, but the vapor also heats the condensate before being cooled by heat exchange with fluid cooled by a cooling tower. 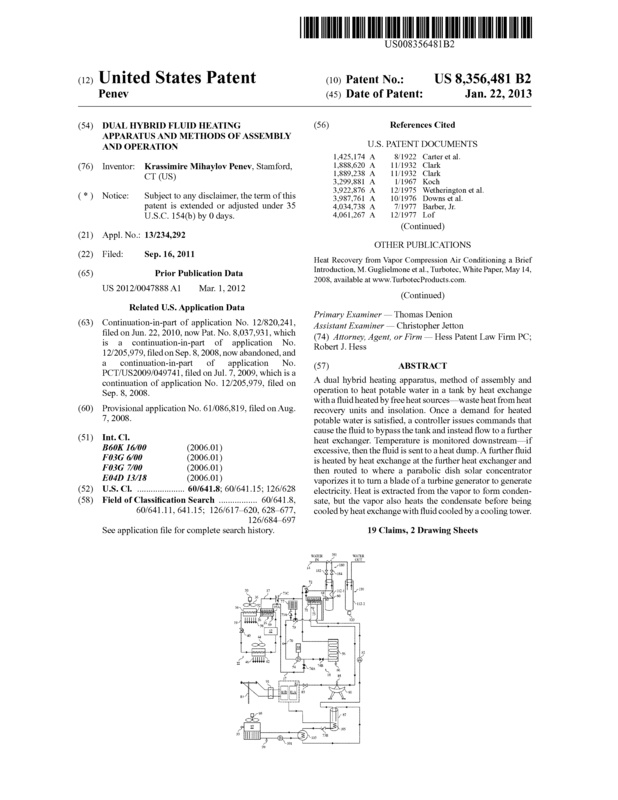 Page created at 2019-04-25 14:41:16, Patent Auction Time.